A crisis was building for Spokane’s streetcar system. The Washington Water Power Co., the private company that ran many of the city’s streetcar lines, had quit serving a number of routes. With the advent of the automobile, WWP was finding it harder to turn a profit and was abandoning some of the unprofitable routes. The city’s commuters, many of whom depended on those routes, were in a bind. They angrily complained to city commissioners, who took on their cause. Now, the city’s lawyer delivered an ultimatum. The city demanded that WWP resume service the next day on two of the abandoned lines, under threat of lawsuit. WWP had not yet responded to the ultimatum. 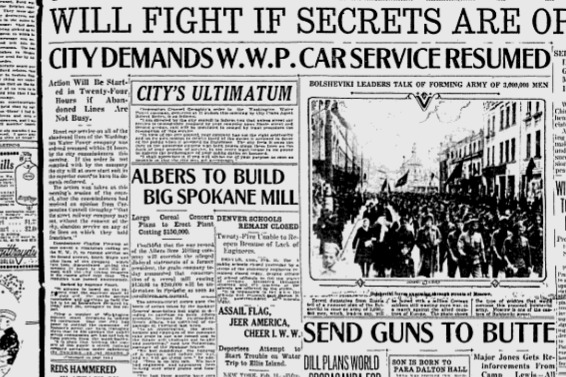 About 30,000 union workers were back on the job in Seattle after the general strike was called off. However, the original impetus for the general strike — the strike of 25,000 shipyard workers — was still not resolved. The shipbuilding industry remained paralyzed. Machine-gunners from Camp Lewis near Tacoma and Fort Wright in Spokane were sent to Butte to keep order during the miners’ strike. The situation there remained tense and the big copper operations were disrupted. One news report said that soldiers were compelled to disperse union picketers with bayonets. Published: Feb. 11, 2019, 5 a.m. Updated: Feb. 11, 2019, 2:21 p.m.